Becky January 25, 2019 January 25, 2019 No Comments on Which Way Now? After our ferry crossing we had made our way to a farm based aire just outside Wissant. Ferme de l’Horloge provides motorhome parking in three locations, and we parked up behind the barn where they provide electricity. We are still not convinced that our batteries are behaving, despite tests telling us everything is fine, and with cold temperatures and snow forecast we wanted to have hook-up so that we didn’t run out of heating part way through the night. Our heating is provided through a gas combi boiler made by a company called Truma (often spellchecked to Trauma, sometimes justifiably), but the warm air is pumped through the van by a fan. The fan is the bit that consumes electricity and it’s a pretty necessary part of the process. When we are on electric hook-up we might supplement or even replace our gas heating with a couple of portable electric heaters. 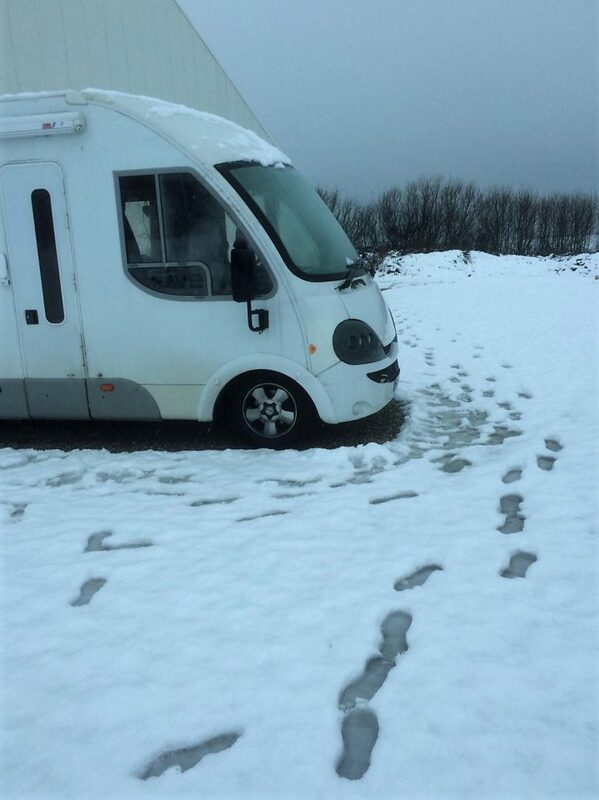 If it’s really cold we have to use the gas heating to get to the parts of the van that the electric heaters don’t reach, specifically the water pipes and tanks, some of which live between the two layers of our ‘floor’. We don’t want the water pipes to freeze because if they burst then we’ll be without a water system. What we hadn’t considered was that the farm was down a single track lane and that the parking is found by driving down a very slight incline to the side of the barn. We woke up the following morning to the sound of our only neighbours trying to get out, about 8cm of snow had fallen in fat flakes over night and it made the going a little tricky. They eventually made it out of the parking but from our vantage point we couldn’t see whether the roads out had been cleared. Because it was still dark we decided not to worry and snuggled up in bed for another hour. We took it easy that morning, we didn’t want to rush and find that the roads were not cleared. We had a leisurely breakfast and, like the excited children we always are in snowy conditions, played in the snow. Finally, at about 10am, we left, spinning our wheels a little as we climbed the very slight slope out of the parking area. We deposited our 8 euros in the honesty box and ventured out onto the road. Fortunately our route back to the main road had been cleared and we got onto the motorway with no problems. 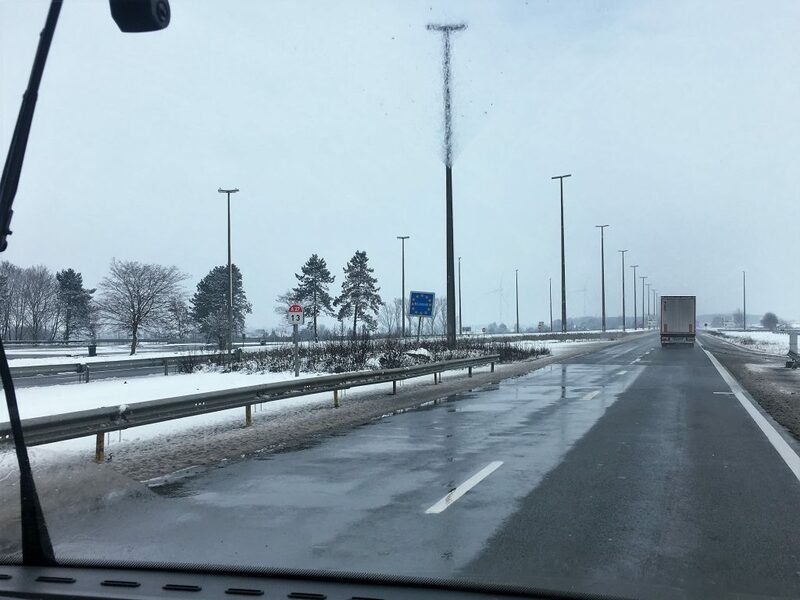 Because of the snow we had reconsidered our route through France and decided to head through Belgium and Luxembourg on the free motorways rather than cutting a direct line across the country to the Alps. We figured that the motorways would be clear and easier to navigate than the regional roads, and we were right – in our direction anyway – on the other side of the road lorries were queued up still waiting for the snow ploughs to get to work. We set our sat nav for an aire in Belgium at Han-sur-Lesse. It was conveniently close to the A4 near the centre of the small town and had plenty of parking plus electricity, the water was off when we arrived (a new tap was being installed, and it wasn’t clear whether the water was off due to the risk of freezing or just because the tap had been damaged). We weren’t expecting to add another country to our list, but why not? Hello Belgium. The magnificently understated border between France and Belgium, thanks to the Schengen agreement.